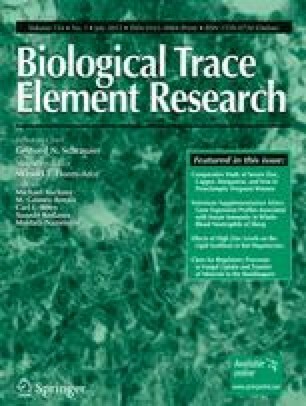 The purpose of the study was to determine the concentration of serum trace and other essential elements of generalized anxiety disorder patients and to find out the relationship between element levels and nutritional status or socioeconomic factors. The study was conducted among 50 generalized anxiety disorder patients and 51 healthy volunteers. Patients were selected and recruited in the study with the help of a clinical psychologist by random sampling. The concentrations of serum trace elements (Zn, Cu, Mn, and Fe) and other two essential elements (Ca and Mg) were determined by graphite furnace and flame atomic absorption spectroscopy. Data were analyzed by independent t test, Pearson’s correlation analysis, regression analysis, and analysis of variance. The serum concentrations of Zn, Cu, Mn, Fe, Ca, and Mg in generalized anxiety disorder patients were 1.069 ± 0.40, 1.738 ± 0.544, 1.374 ± 0.750, 3.203 ± 2.065, 108.65 ± 54.455, and 21 ± 4.055 mg/L, while those were 1.292 ± 0.621, 0.972 ± 0.427, 0.704 ± 0.527, 1.605 ± 1.1855, 101.849 ± 17.713, and 21.521 ± 3.659 mg/L in control subjects. Significantly decreased (p < 0.05) serum Zn concentration was found in the patient group compared to the control group while serum level of Cu, Mn, and Fe was significantly (p < 0.05) higher, but the differences of the concentration of Ca and Mg between the patient and control groups were not significant (p > 0.05). Socioeconomic data revealed that most of the patients were in the lower middle class group and middle-aged. Mean BMI of the control group (23.63 ± 3.91 kg/m2) and the patient group (23.62 ± 3.77 kg/m2) was within the normal range (18.5–25.0 kg/m2). The data obtained from different interelement relations in the generalized anxiety disorder patients and control group strongly suggest that there is a disturbance in the element homeostasis. So changes in the serum trace element level in generalized anxiety disorder patients occur independently and they may provide a prognostic tool for the diagnosis and treatment of this disease.